What type of keg do I use? I want to start kegging. Where do I start? What type of keg does everyone recommend? I would love to hear some suggestions, especially what not to do as much as what has worked for you. I would suggest using a cornie (cornelius) style keg for kegging your homebrew. They have a large opening on the top which makes them easier to clean. If you have the money to invest, you could go sanke, but the cleaning equipment is damn expensive. I prefer the ball lock style (made for pepsi) than the pin lock style (coke) merely because I got free ones from a pepsi rep. There is a thread on this forum as to where to get them pretty darn cheap. cheapest place you will find is MO malt supply in Fenton. i have all the info, its kind of a fight club scenario, so there is no advertising, sign, or any available info and pickups are between 5:30 and 7 on thursday nights. true. but stuff is crazy cheap from him. i swear that i think it is legal. I've bought kegs from various sources, some online, some homebrew supply shops and from friends. I have both 3 gal and 5 gal kegs, all ball-lock. #1 - stick to 5gal kegs, even if you are doing small batches. 3 gal kegs take up just as much space in your fridge as a 5 gal keg, and you just need to purge with c02 to ensure quality. #2 - make sure they hold pressure before you buy them. if you don't you may be in for an easter egg hunt to find where the leaky seal is. #3 - always have a complete seal kit on hand, nothing worse than getting that new brew on gas at 11pm and finding the keg is leaking. #4 - start out small, but plan on purchasing a small backup tank. inevitably, you will run out of gas when all shops are closed and you have 6 full kegs sitting in the fridge. #5 - choose kegs with a welded relief valve housing. I have lids with welded and weld-less relief valves.... the weld-less ones are falling apart (the plastic is oxidized to brittle) and are therefore impossible to fully disassemble for cleaning and tend to leak a bit. The welded bodies are great, easy to clean and no leaks. #6 - Dual regulators, though not necessary, are really convenient for maintaining serving pressure and carbing pressure on kegs at the same time. #8 - Kegs with the dual rubber handles are easier to move when full and easier to clean as you can stand them upside down to drain. They are also stackable while standing. The single handled ones are easier to maneuver lines through and around, and don't run the risk of the rubber disbonding from the steel, which happens with the rubber ones. #9 - Kegs from the LHBS carry a warranty.... and are usually clean already. Other sources it can be a big job to get them ready for the first use. #10 - Always have enough beer to keep your kegs full. It's just more fun that way. that's a great write up lake! only other thing i would mention is to buy more kegs than you have faucets (or picnic taps or whatever) and use them as bright tanks for the beer. 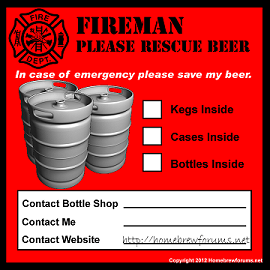 it works great and then when one keg kicks, you have another right there to slide into place that is already gassed and ready to go! good point. i have ~2xtaps of kegs. 4 taps, and roughly 8 kegs. seems like the right ratio. Awesome advice. I am as overwhelmed as I anticipated. it can be a lot at times, but in the end, it's all about the beer. If you pick out your kegging system feel free to run it by us before purchase. Wow. Great advice Lake. The only thing I can add is I use ball locks because they are taller and skinnier than pin locks. I was able to fit four ball locks in my kegerator rather than three pin locks. Although, pin locks seem to be a little cheaper across the major sites. Spot on Lakewood, I too am with u on the 3 gal kegs, Why go with less than 5 gallons when time and space are the same. the amazing thing is, the three gallon kegs are typically more expensive than 5's. Mine was a hand me down. Can't imagine paying a premium for one. I found a fridge/keg conversion kit on craigslist, $150, seems like a good deal, includes: 2 bottles of cleaning solution, cleaning kit, tap handle, sanke keg tap, tap hose, faucet, faucet wrench, CO2 regulator, CO2 hose, and CO2 tank. Am I assume correctly that I can switch this to a corny ball lock pretty easily? I want to buy a few ball locks and I thought this was a good way to begin my keggerator or keezer setup. I just noticed, when Lake posted before, I was exactly 11,000 posts behind, that is something to work toward. you should be able to sell the sanke keg tap and get a few ball lock quick disconnects with the money. Or, I could keep it for guest taps. Don't most breweries use sanke taps? Yep. Unless you need the money for the swap, I would keep it. It will come in handy. when you want to buy kegs, let me know. that MO malt supply usually sells good ones for 35 bucks. that's where i bought most of mine and that's super cheap. I checked w/Mo malt, and they were sold out, so I went this route. I paid $45 each for four. Old soda kegs, came with new or spare o rings. They had pressure in them to prove that they held pressure. Now comes the next steps i guess. Cleaning, finding lines, etc. What size lines do I get? Any recommendations or just head to the local HB store and let them fill me in? I also intend to get a four line valve and four taps. I am picking up the one tap tomorrow w/tank and valve. i ordered all my lines and everything else from midwest. i just used standard stuff, what's that 3/8" or something? i could be wildly wrong about that, i'm not entirely sober. I looked at Midwest, they sell 5/16 gas line and 3/16 beer line. So I guess, I will go with that. However they sell a 5/16 and 1/4" four way splitter. Sort of confusing, so I guess I go with 5/16, since they don't sell the 1/4. Makes sence to me. Lines depend on your exact setup. But the way I did it was i started with 12'x 3/16" lines and went from there. That seems to be a pretty good pour on a picnic tap. I'm still using picnic taps because I came up with this swell idea to have a kegerator in the basement and taps in the kitchen, so I never fully finished the kegerator. this is supposedly the best thing to ever happen to beer serving. you'll need about double length lines, as the resistance is half that of normal lines. it's also far less permeable, so they're far easier to clean and never pick up flavor from what runs through them. Well, the writeup sounds impressive. What do you mean by double length lines? Twice as much line, or half as much? twice as much. which is why it's sold in 50' bundles. SOB. That's a lot of line strung around the fridge.